President Obama is scheduled to deliver a speech this afternoon outlining his plans for changes to corporate tax rates and other provisions affecting U.S. companies. According to press reports, President Obama will call for the corporate tax rate to be lowered from 35% to 28%, with a reduced rate of 25% on manufacturers. At the same time, however, the White House is considering changes that would go after profits held internationally by U.S. companies, make writing off the cost of new investments in plants and equipment more difficult, and impose a minimum tax rate for companies operating overseas. The President has often spoken in favor of the need to reduce the U.S. corporate tax rate, and he’s right – we have the highest rate in the world and that needs to come down in order to make us more competitive around the world. But improving the corporate tax code with one hand while placing extra burdens on U.S. companies with the other is not going to lead to the increase in jobs and economic growth we need. When it comes to the corporate tax code, there are two major changes that will stimulate investment and lead to greater economic growth. One, as the President has acknowledged, is cutting the corporate rate. The other, which he seems dead set against, is to follow the lead of our major trading partners and only tax corporate profits that are earned in this country. The final problem with this plan is the attempt to combine a vital reform like lowering the corporate rate with billions more in federal spending to provide a temporary jobs stimulus. A growing economy is the best jobs program we could ask for, and only policies that contribute to that goal should be moving forward. 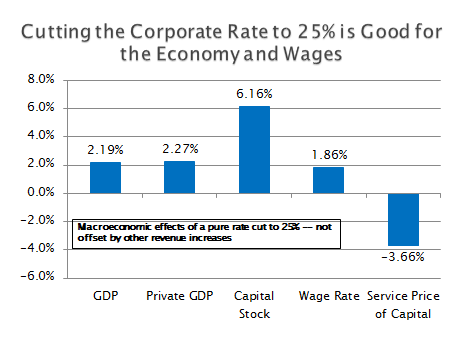 The Tax Foundation’s dynamic growth model has found that cutting the corporate tax rate to 25%, even with no offsetting changes in other provisions, would boost GDP by over 2% and wages by nearly 2%, and ultimately increase federal tax revenues. These advantages would accrue without the need to pay for a rate cut by increasing taxes on U.S. companies operating abroad or worsening the write-offs for capital investments.